Pathogenic Yersinia species (Y. enterocolitica, Y. pestis, Y. pseudotuberculosis) share a t ype t hree s ecretion s ystem (TTSS) which allows translocation of effector proteins (called Yops) into host cells. It is believed that proteins are delivered through a hollow needle with an inner diameter of 2–3 nm. Thus transport seems to require substrates which are essentially unfolded. Recent work from different groups suggests that the Yersinia TTSS cannot accommodate substrates which are folded prior to secretion. It was suggested that folding is prevented either by co-translational secretion or by the assistance of s pecific Y op c haperones (called Sycs). In this study we have fused YopE secretion signals of various length to the mouse dihydrofolate reductase (DHFR) in order to analyse the DHFR folding state prior to secretion. We could demonstrate that secretion-deficient as well as secretion-competent YopE-DHFR fusions complexed to SycE can be efficiently purified from Yersinia cytosol by affinity chromatography using methotrexate-agarose. This implies the folding of the DHFR fusion moiety despite SycE binding and contradicts the previously presented model of folding inhibition by chaperone binding. Secretion-deficient YopE-DHFR fusions caused severe jamming of the TTSS. This observation contradicts the co-translational secretion model. We present evidence that the Yersinia TTSS is familiar with the processing of transport substrates which are folded prior to secretion. We therefore predict that an unfoldase is involved in type III secretion. Pathogenic Yersinia species use a type III secretion system (TTSS) encoded by the virulence plasmid to inject a number of effector proteins (Y ersinia o uter p roteins, abbrev. Yops) into eucaryotic host cells [1–3]. The complex transport machinery (also denoted as injectisome) consists of some 25 components. A needle-like structure, polymerized from YscF, with a hollow center of about 2–3 nm seems to form a conduit for Yop transport into eucaryotic host cells . The transport signal of Yops has been assigned to the first 10 to 17 codons of the respective gene [5–8]. Yet, what makes the signal a signal is not clear. Anderson and Schneewind  proposed a signal at the mRNA-level. This mRNA element was suggested to couple translation and secretion of Yops, implying a co-translational transport mode . Ramamurthi and Schneewind [9, 10] recently presented further evidence that the YopQ secretion signal might not be proteinaceous. However, work from Lloyd et al. [11, 12] supports the idea of an N-terminal peptide moiety with characteristics of an amphipathic sequence acting as transport signal for YopE. As controversial as the question of the signal's nature is that of the mode of transport. The mRNA signal hypothesis is linked to a co-translational secretion model [5, 6], whereas an N-terminal signal peptide is compatible with both a co- or post-translational transport mechanism. This issue is even more complicated by the fact that the transport of several Yops is assisted by their s pecific Y op c haperones (e.g. YopE is assisted by SycE) whereas others such as YopQ – as far as known – are not assisted by chaperones. The minimal binding site of SycE has been mapped to residues 23–50 of YopE [7, 13, 14]. This binding site in complex with a SycE dimer has been suggested to constitute an additional, three-dimensional secretion signal  introducing a hierarchy of effector targeting . SycE binding has been shown to be dispensable for secretion of YopE to the culture supernatant but is required for translocation into eucaryotic cells [11, 16]. Additionally, YopE can be targeted to the type III machinery and secreted to the supernatant, although less efficient, without the first 15 N-terminal codons/aa residues solely by means of SycE assistance . 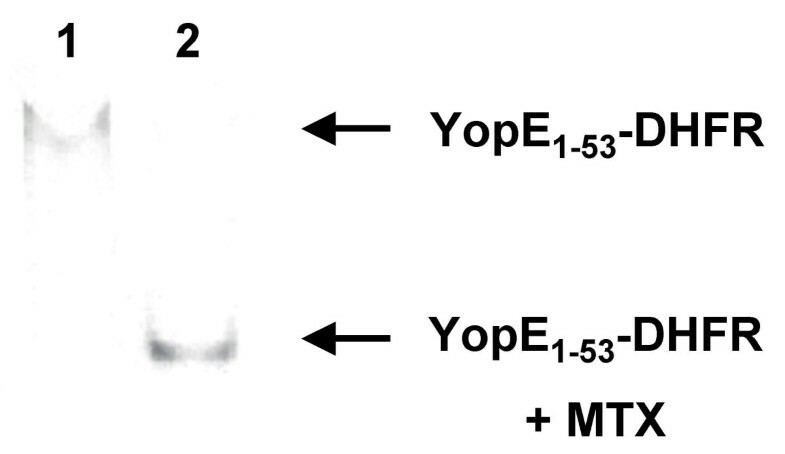 Post-translational secretion of YopE has been demonstrated [6, 11, 18]. With the evidence for a post-translational secretion mechanism the question arose whether Yop transport occurs in a (partially) folded or unfolded form. Mouse dihydrofolate reductase (DHFR; 21.6 kDa) has been successfully applied as a reporter in eucaryotic systems to address the question of the folding state of transported proteins [19–22]. The stability of the folded DHFR domain can be manipulated by treatment with specific ligands such as methotrexate (MTX). Recently, two studies were published applying the DHFR tool to analyse the properties of the Yersinia TTSS. Lee and Schneewind  reported on a YopE1–15-DHFR fusion and a YopE1–220-DHFR fusion (full length of YopE) which were not secreted by the TTSS of Yersinia enterocolitica. This lack of secretion competence however did not interfere with secretion of other Yops. Further, ubiquitin which rapidly folds into a stable tertiary structure was fused to YopQ and YopE signals of different length. Again, all fusions were secretion-incompetent and did not interfere with secretion of other Yops. Only when a folding-deficient ubiquitin was fused to the YopE1–15 signal was efficient secretion observed. Thus, it was concluded by Lee and Schneewind  that folding of DHFR and ubiquitin hindered secretion of the fusions. Further, the observation that the secretion-incompetent proteins did not lead to an occlusion of the TTSS prompted the authors to propose a model supporting the mRNA signal hypothesis: After signal recognition a substrate that cannot be accommodated would be rejected and – after separation from its mRNA – could not be reinitiated into the secretion machinery. A second report deals with the role of SycE in secretion of YopE-DHFR fusions . DHFR and folding deficient mutants thereof were fused to YopE signals encompassing the first 16, 52, 80 and all 219 amino acid (aa) residues. The major outcome of this study was that wild-type DHFR could only be secreted when fused to YopE1–52 and that this secretion was strictly dependent on the presence of SycE. All other fusions required mutations in DHFR in order to allow secretion. Altogether, Feldman et al. concluded that folding of DHFR was not compatible with its secretion competence and that SycE allowed secretion of wild-type DHFR as part of the YopE1–52 fusion by preventing its folding. In apparent contrast to Lee and Schneewind , Feldman et al. could demonstrate the occlusion of the TTSS by several YopE-DHFR fusion constructs. In parallel to these groups we have also applied the DHFR approach to the Yersinia enterocolitica TTSS. Contrary to the studies mentioned above our conclusion is that the Yersinia TTSS can deal with secretion substrates essentially folded prior to secretion. Since the transport channel seems to be too narrow to allow passage of such folded domains we propose an unfoldase activity associated with the TTSS. Initially, based on a previous study on YopE-GFP fusions , we started to analyse secretion of wild-type DHFR fused to YopE secretion signals (the first 18, 53 and 138 aa residues). In accordance with Lee and Schneewind  and Feldman et al. we found that YopE1–18-DHFR and YopE1–138-DHFR fusions were not secreted by the Yersinia TTSS (details below). Our YopE1–53-DHFR fusion was secreted in the presence of SycE as was the YopE1–52-DHFR fusion described by Feldman et al. . However, our further analysis prompted us to conclude that the DHFR moiety of YopE fusions was folded. This was based on protease protection analyses (Fig. 1) and native gel analyses (Fig. 2) of cytosolic fractions. In order to prove entry of DHFR ligands such as methotrexate (MTX) or aminopterin (APT) into the cytosol of yersiniae we have prepared spheroplasts from yersiniae pretreated with APT, MTX or untreated. Spheroplasts were subsequently lysed and binding of the ligands MTX and APT to cytosolic YopE1–53-DHFR was then challenged by testing the resistance against the protease thermolysin (Fig. 1). Surprisingly, even concentrations as high as 1 mM of MTX or APT present in the yersiniae cultures were insufficient to protect the DHFR moiety from proteolytic digestion. Hence, we were not able to saturate the intracellular pool of DHFR fusions with either of the ligands since control experiments shown in Fig. 1 demonstrate that addition of MTX or APT to cytosol of untreated yersiniae rendered the DHFR moiety of the fusions resistant to protease attack. Feldman et al. anticipated that MTX could not be used because E. coli is known to efficiently export MTX . In contrast, APT was expected to enter the Yersinia cell because an apparent growth restriction could be observed . However, the entry of neither drug has been proven directly. Protease protection assay on cytosolic YopE1–53-DHFR prepared from spheroplasts. Spheroplasts were prepared from yersiniae induced for Yop expression and treated with 1 mM methotrexate (MTX), 1 mM aminopterin (APT) or untreated, respectively. Spheroplasts were washed three times and subsequently lysed by osmotic shock, then soluble supernatants after centrifugation (cytosolic fractions) were treated with thermolysin (0, 1, 10 μg/ml). As "control", cytosol from untreated yersiniae was incubated with 1 mM MTX and 1 mM APT, respectively, prior to thermolysin exposition. After incubation at 20°C for 15 minutes samples were loaded on an SDS gel that was electroblotted. Immunostaining was performed with anti-DHFR monoclonal antibodies. Native gel electrophoresis reveals binding of methotrexate (MTX) to YopE1–53-DHFR. Cytosolic fractions from yersiniae expressing YopE1–53-DHFR were prepared as described in legend to Fig. 1. Cytosolic fraction was loaded directly on a HEPES-buffered native gel (lane 1) and after further incubation with 1 mM MTX (lane 2). After electrophoresis gel was electroblotted and DHFR-fusions were detected using anti-DHFR antibodies. We have noticed that for analysis of cytosolic fusions it was crucial to prepare spheroplasts. Initially, we had lysed complete yersiniae pretreated with these drugs and even though we had extensively washed the bacteria prior to lysis we found the complete pool of DHFR saturated with the ligands. Thus, either the periplasmic space was loaded with MTX/APT or the bacterial surface was coated so that after cell lysis the released ligands could bind to DHFR causing artificial protection towards thermolysin. From the protease protection analyses of spheroplast preparations we can conclude the following. First, neither APT nor MTX efficiently enter the cytoplasm which limits the potential of the DHFR tool in Yersinia. Second, cytosolic YopE1–53-DHFR prepared from spheroplasts can be stabilised by addition of MTX or APT suggesting that the DHFR moiety is properly folded. The latter conclusion was further confirmed by native gel electrophoresis of cytosolic preparations as represented in Fig. 2. We found that the electrophoretic mobility of YopE1–53-DHFR was significantly increased in the presence of MTX. This might be explained by a more rigid conformation of the DHFR-ligand complex. This finding shows that the complete pool of soluble YopE1–53-DHFR is accessible to MTX binding which suggests the folding of DHFR. We could not rule out that the obvious discrepancy between our observations and the well supported hypothesis presented by Feldman et al. was due to the slight difference between our YopE1–53-DHFR construct and the YopE1–52-DHFR fusion studied by Feldman et al. . Thus, we mimicked their YopE1–52-DHFR construct to analyse a fusion with the identical aa sequence. Fig. 3A schematically depicts the YopE-DHFR constructs studied. YopE-DHFR fusions were expressed in Yersinia enterocolitica WA-314  under the control of the yopE wild-type promoter using the moderate-copy-number plasmid pACYC184 . Fig. 3B illustrates Western blot results from secretion studies. YopE1–18-DHFR and a YopE1–138-DHFR fusion were not secreted by the Yersinia TTSS whereas YopE1–52-DHFR and YopE1–53-DHFR were secreted specifically as revealed by comparison with the secretion deficient yscV (lcrD) mutant . We determined that approximately 7% of all YopE1–52-DHFR and 6% of YopE1–53-DHFR was secreted whereas 38% of YopE was secreted in the wild-type yersiniae. Analysis of these secretion experiments on SDS-PAGE follwed by Coomassie-staining is shown in Fig. 3C. 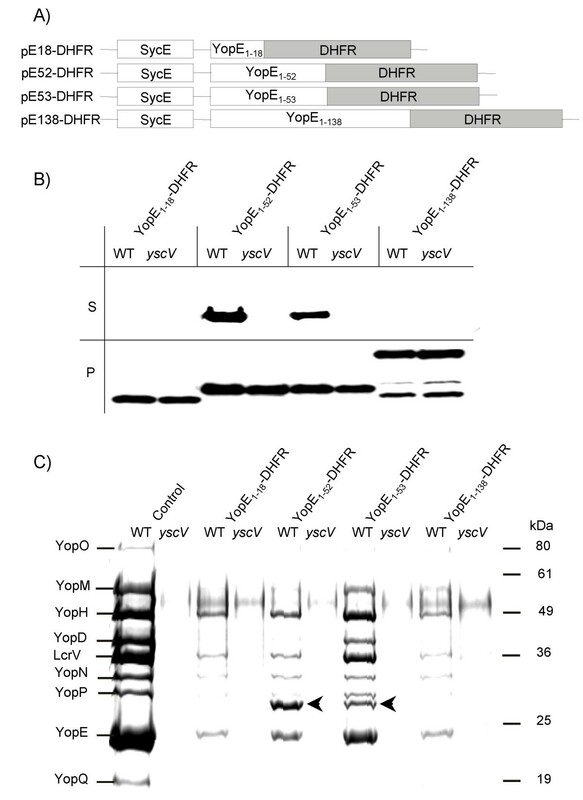 Fusions YopE1–18-DHFR and YopE1–138-DHFR, which proved to be incompetent for secretion caused severe jamming whereas secretion of YopE1–52-DHFR and YopE1–53-DHFR was accompanied by less dramatic effects on Yop secretion. Noteworthy, the jamming caused by YopE1–52-DHFR was more pronounced than that observed in context of YopE1–53-DHFR secretion. Feldman et al. when investigating YopE1–52-DHFR in a multi-Yop mutant did not observe an effect on secretion of YopD and YopN . Likely, competition of the effector Yops secreted in parallel in our experimental setting can explain these differences. Lee and Schneewind  predicted a mechanism allowing the rejection of secretion-incompetent (e.g. folded) substrates and an mRNA signal that selects against folded proteins dissociated from their mRNA. According to that model jamming caused by engagement of folded substrates should not occur. The jamming effects of DHFR fusions on Yop secretion presented here and that reported by Feldman et al. for YopE1–80-DHFR and YopE1–219-DHFR fusions contradict this model. Expression and secretion of YopE-DHFR fusions. (A) Scheme depicts plasmid constructs pE18-DHFR, pE52-DHFR, pE53-DHFR and pE138-DHFR, allowing expression of YopE N-termini (the first 18, 52, 53 or 138 aa) fused to DHFR and concomitant expression of YopE-chaperone SycE. (B) Yersiniae (Y. enterocolitica strain WA-314, abbrev. WT, and its secretion deficient yscV mutant (also termed lcrD)) expressing YopE-DHFR fusions were cultured for 2 h at 37°C in BHI medium. Then Yop secretion was induced by Ca2+-depletion with EGTA. After 1.5 h of continued incubation bacteria were pelleted and whole cell lysates (P) and TCA-precipitated supernatants (S) were subjected to SDS-PAGE; ten times more supernatant than cell pellet was loaded. Subsequently, immunoblotting was performed with monoclonal anti-DHFR antibodies. (C) Coomassie-stained SDS-PAGE of supernatants from a secretion experiment as described above (Fig. 3B). The first two lanes show Yop secretion of the parental hosts. Arrows indicate secreted YopE1–52-DHFR and YopE1–53-DHFR. Feldman et al. 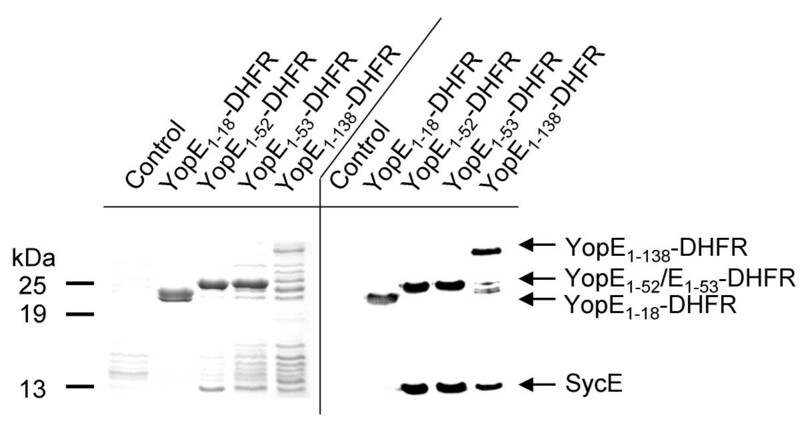 have claimed that SycE binding to YopE1–52-DHFR prevents DHFR folding . However, this was not proven directly. We challenged this hypothesis by affinity purification of DHFR fusion proteins from yersiniae cytosol using MTX-agarose. Fig. 4 exemplifies this approach. Yersiniae expressing the respective fusions were induced for Yop secretion (similar results are obtained when yersiniae were grown at 37°C in the presence of calcium or when the secretion deficient yscV mutant was used) and lysed by French press treatment (alternatively, lysozyme treatment was possible). MTX-agarose was added to the cleared supernatants after high speed centrifugation and incubated on ice for 1 h. Subsequently, MTX-beads were centrifuged, washed five times in ice-cold PBS and subjected to SDS-PAGE analysis. Coomassie staining (Fig. 4, left panel) and Western blotting (Fig. 4, right panel) revealed the specific binding of the fusion proteins to MTX-agarose. Co-purification of SycE was verified by Western-blotting but was also visible on the Coomassie-stained gel. As expected, SycE did not co-purify with YopE1–18-DHFR fusion, since this construct does not include the SycE binding site. This experiment shows that SycE binding to YopE1–52-DHFR does not exclude folding of DHFR in principle. Since efficiency of these purifications was determined to be between 25 and 50%, the species enriched cannot be considered rare. Though we cannot rule out that the 7% of YopE1–52-DHFR secreted exhibit another conformation this is rather unlikely because protease protection assays and native gel analyses indicate that the complete pool of soluble DHFR fusion proteins is accessible to MTX binding and thus folded. This is further substantiated by the fact that no DHFR degradation products derived from YopE1–52-DHFR were detectable when blotting whole cell lysates (see Fig. 3B). Affinity purification of YopE-DHFR fusions using MTX-agarose. Yersiniae expressing DHFR fusions as indicated were lysed by French press treatment and soluble supernatants after centrifugation were incubated with MTX-agarose beads on ice for 30 min. Beads were washed with PBS five times, subsequently resuspended in SDS loading buffer and subjected to SDS-PAGE. Left panel represents a Coomassie stained gel, right panel a Western blot analysed with monoclonal anti-DHFR antiserum and polyclonal anti-SycE antiserum simultaneously. As control served Y. enterocolitica WA-314 harbouring plasmid pACYC184. Others might argue that SycE binding to these secretable DHFR fusions could slow down folding of the DHFR moiety so that these fusions remain secretion competent for a certain time. If this argument would hold then secretion should decrease rapidly after inhibition of protein translation. To test this argument we inhibited protein biosynthesis with tetracycline and induced Yop secretion 20 minutes thereafter. Fig. 5 shows that significant secretion of YopE1–52-DHFR and YopE1–53-DHFR could be demonstrated after inhibition of protein biosynthesis. This finding is both in accordance with the reported possibility of post-translational secretion of YopE [11, 18] and in support of our view that the TTSS is capable of secreting proteins folded prior to secretion. Secretion of YopE1–52-DHFR and YopE1–53-DHFR after inhibition of protein biosynthesis. Yersiniae (Y. enterocolitica strain WA-314, abbrev. 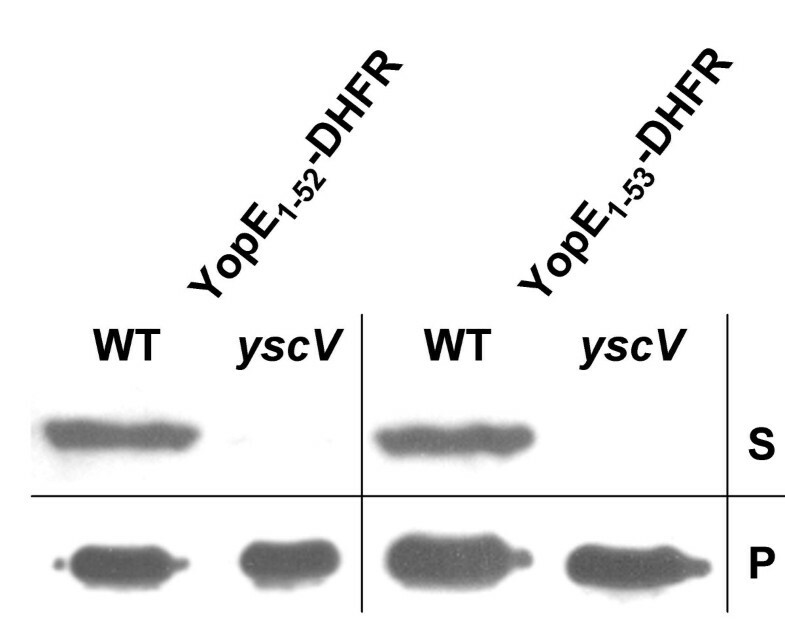 WT, and the secretion deficient yscV mutant) expressing YopE1–52-DHFR and YopE1–53-DHFR, respectively, were cultured for 2 h at 37°C in BHI supplemented with CaCl2. Then 50 μg/ml of tetracycline was added to inhibit protein synthesis and cultures were incubated for another 20 min. Then bacteria were pelleted and resuspended in BHI depleted of Ca2+ to induce Yop secretion in the presence of tetracycline. After 20 min of continued incubation bacteria were pelleted and whole cell lysates (P) and TCA-precipitated supernatants (S) were subjected to SDS-PAGE; ten times more supernatant than cell pellet was loaded. Subsequently, immunoblotting was performed with monoclonal anti-DHFR antibodies. In summary, our data show show that the DHFR moiety of YopE1–52-DHFR and YopE1–53-DHFR fusions was predominantly folded in a state that was competent to bind MTX and that this folding state of DHFR was compatible with SycE binding to fusions YopE1–52-DHFR and YopE1–53-DHFR. Since these fusions were secretable, we conclude that folding of substrate proteins prior to secretion is compatible with Yersinia type III secretion in principle. Though in obvious discrepancy to the view of Lee and Schneewind  as well as that of Feldman et al. we feel that our conclusions are well supported by several studies. Feldman et al. have claimed that SycE bound to a YopE1–52-DHFR fusion prevents DHFR folding by overlapping the DHFR moiety physically . Since the crystal structure of the SycE dimer complexed to YopE23–78 clearly shows that YopE is wrapped around the SycE dimer  and not vice versa it is hard to imagine how SycE binding should overlap with the fused DHFR domain. Further, it is clear from the studies of Birtalan et al. that the influence of SycE on YopE is restricted to the chaperone binding site and does not extend globally since the RhoGAP domain of a (SycE)2/YopE complex was catalytically active. Moreover, comparison of the structure of the SycE dimer uncomplexed  with that of SycE complexed to the YopE chaperone binding site  reveals that SycE serves as a purely static binding platform. Thus, an unfolding activity of SycE is unlikely. Hence, the Yersinia TTSS generally has to deal with folded secretion substrates. In addition, it has been shown by isothermal titration calorimetry studies of Tir/CesT from enteropathogenic E. coli as well as by enzymatic activity profiling of Salmonella enterica SigD/SigE  that these effectors are not globally unfolded when bound to their specific chaperones. This suggests that storage of for the most part folded effectors in the presence of their specific chaperones is a common feature of type III secretion systems. Stored effectors must be either unfolded prior to secretion or the TTSS must be able to secrete folded proteins. Recently, needles of the injectisomes of Shigella  and Yersinia TTSSs  have been visualized by electron microscopy showing a hollow center with a diameter of 20–30 Å. Needles of the Salmonella TTSS1 with an outer diameter of 13 Å are even thinner . In comparison, the minimal diameter of the YopE catalytic domain is approximately 25 Å , that of the YopH catalytic domain is at least 40 Å , and that of the heterologous substrate DHFR is around 32 Å . Ubiquitin, which cannot be secreted by the Yersinia TTSS  has a minimal diameter of approximately 24 Å . Thus, it is generally believed that secretion does not occur with substrates in a folded form. Therefore, we propose that TTSS systems possess unfolding machineries to process the stored pool of effectors. Accordingly, it seems possible that the machinery can unfold heterologous substrates under certain conditions. Substrates such as the fusions YopE1–18-DHFR and YopE1–138-DHFR are identified as potential secretion substrates and engaged by the machinery. Yet, due to the inability to unfold these proteins they cause plugging of the pore. Other fusions such as YopE1–52-DHFR and YopE1–53-DHFR can be unfolded with some efficiency. An explanation for the dependency of SycE to transport DHFR fusions might be that SycE recruits and facilitates the binding of the proposed unfoldase so that it can efficiently pull on the polypeptide chain and trap local unfolding fluctuations. As reviewed by Matouschek  the characteristics of a protein to resist unravelling are not determined by its stability against global unfolding. The resistance is rather determined by the local structure first encountered by the unfoldase after recognition of the substrate. In that light, small differences among fusion constructs may influence efficiency of unfoldase to unravel substrates and may lead to dramatically different secretion phenotypes. Gorbalenya and Koonin  were the first to describe the relationship between Rho helicase, V- and F-type ATPases, and the flagellar ATPase FliI, an homologue of the Yersinia TTSS ATPase YscN. A recent phylogenetic classification of P-loop NTPases suggests that all these NTPases belong to the group of unfoldases . Thus, we hypothesise that the ATPase YscN could be a suitable candidate for unfolding of TTSS substrates prior to secretion. We want to stress that this issue is far from being clarified and introduce to this discussion the possibility that unfolding of TTSS substrates prior to secretion may occur. The folding state of type three secretion substrates before and during transport has not been clearly defined. Using a DHFR fusion approach we have addressed these questions. We found that DHFR ligands methotrexate and aminopterin poorly entered Yersinia enterocolitica cells which limited the applicability of the DHFR tool. YopE1–18-DHFR and YopE1–138-DHFR fusions proved secretion-deficient and caused plugging of the secretion machinery. This indicates that folding of these artificial secretion substrates interfered with the secretion process. However, we could demonstrate secretion of YopE1–52-DHFR and YopE1–53-DHFR fusions even after inhibition of protein synthesis. Further, we showed that folding of the DHFR-moiety of these fusions as monitored by ligand binding was compatible with binding of the YopE secretion chaperone SycE. We conclude that the Yersinia TTSS is familiar with the processing of transport substrates which are folded prior to secretion and postulate that an unfoldase is involved in type III secretion. YopE-DHFR fusion constructs were generated by introducing a BamHI-SalI fragment of murine dhfr into vectors pCJYE18-G3, pCJYE53-G3 and pCJYE138-G3  after excission of the BamHI-SalI fragment encoding GFP3. The HindIII-BamHI fragment encoding the YopE amino-terminus of the respective YopE fusion also encodes SycE allowing the coexpression of this chaperone . The BamHI-SalI fragment encoding DHFR was generated by PCR using primers 5'-GGATCCATGGTTCGACCATTGAACTGC-3' and 5'-GTCGACGGCCGGATCTAAAGCCAGC-3'. The murine dhfr used as template was a gift from Walter Neupert. Resulting plasmids were termed pE18-DHFR, pE53-DHFR and pE138-DHFR. Plasmid pE52-DHFR encoding a YopE1–52-DHFR fusion was generated by HindIII-BamHI mediated excision of the sycE-yopE1–18 fragment from plasmid pE18-DHFR and insertion of a PCR-generated sycE-yopE1–52 fragment flanked by HindIII and BglII restriction sites. As host strains for expression and secretion of Yop-DHFR fusions served the Yersinia enterocolitica strain WA-314  harbouring the pYV virulence plasmid and its secretion deficient yscV/lcrD mutant WA-C (pYV-515) . Chloramphenicol (20 μg/ml), nalidixic acid (60 μg/ml), kanamycin (50 μg/ml) were used as selective antibiotics. Overnight cultures were incubated at 27°C in BHI medium. For secretion experiments yersiniae were diluted 1:20 from overnight cultures and incubated for 2 h at 37°C in BHI medium; if indicated, CaCl2 was added to 2.5 mM to completely suppress Yop secretion. For secretion of Yops BHI medium was supplemented with 10 mM MgCl2, 0.2% glucose and 5 mM EGTA (BHI-EGTA; ). Methotrexate (MTX) and aminopterin (APT), were dissolved in DMSO (100 mM stock concentration) and added to the medium 10 min before induction of Yop secretion to a final concentration of 1 mM. Accordingly, controls were treated with 1% DMSO. DMSO did not significantly influence secretion or viability of yersiniae cultures. Cells and supernatants were separated by centrifugation; proteins from supernatants were precipitated with TCA, the pellet washed twice with acetone, once with water. Cell pellets and protein pellets after TCA precipitation were resuspended in SDS-PAGE loading buffer as recently described  und subjected to SDS-PAGE and Western blotting. Yop-DHFR fusions were detected with monoclonal anti-DHFR antibodies (Becton Dickinson), SycE was detected with a polyclonal antiserum from rabbit. Specifics of each experiment are given in the figure legends. For the analysis of protein secretion after inhibition of protein synthesis the standard protocol was modified as follows. Overnight cultures were diluted as described above and grown in the presence of 2.5 mM CaCl2 at 37°C for 2 h. Then tetracycline was added to a final concentration of 50 μg/ml to inhibit protein biosynthesis. After 15 min of continued incubation in the presence of tetracycline bacteria were pelleted and resuspended in BHI supplemented with EGTA and tetracycline. Bacteria were cultured for another 20 min and supernatant and cell pellets were analysed by western blotting as described above. The efficiency of tetracycline treatment was verified by a complete inhibition of cell growth and by comparison to recently published methods based on treatment with chloramphenicol [11, 18]. YopE-DHFR fusions were purified from yersiniae lysates using MTX-agarose (Sigma). Yersiniae expressing DHFR fusions were lysed by French press treatment and soluble supernatants after centrifugation were incubated with MTX-agarose beads on ice for 30 min. Beads were washed with PBS five times, subsequently resuspended in SDS loading buffer and subjected to SDS-PAGE. Spheroplasts from yersiniae induced for Yop expression and treated with 1 mM methotrexate (MTX), 1 mM aminopterin (APT) as described above or untreated, respectively, were prepared as described . Speroplasts were washed three times and subsequently lysed by osmotic shock resuspending them in 10 mM Tris-HCl pH 7.5, and soluble supernatants after centrifugation (cytosolic fractions) were treated with thermolysin (0, 1, 10 μg/ml). 6% AA gels (25 mM HEPES pH 7.4 (Invitrogen), 5 mM NaCl, 1 mM DTT) were pre-run for 30 min at 80 V prior to sample application . Samples were loaded using a 5× sample buffer (25 mM HEPES pH 7.4, 5 mM NaCl, 1 mM DTT, 50% glycerole) and subjected to electrophoresis at 80 V for 2–3 h. Subsequently gels were electroblotted. Cytosolic fractions were prepared from spheroplasts after osmotic shock lysis and concentrated on Amicon (Millipore) concentrators (10 kDa molecular weight cut off) if necessary. Protein concentration was determined (Bio-Rad, Protein Assay) and 5 μg of protein was loaded per lane. MTX (100 mM stock solution, dissolved in DMSO) was added to 1 mM final concentration (to controls 1% of DMSO was added). We are grateful to Walter Neupert for providing dhfr template. We thank Christoph Jacobi for providing plasmids pCJYE18-G3, pCJYE53-G3 and pCJYE138-G3 and Konrad Trülzsch and Susanne Kähler for critical reading of the manuscript. This work was supported by the Deutsche Forschungsgemeinschaft (SFB 594 Teilprojekt B6). G.W. developed the native gel electrophoresis method, coached the lab staff, and wrote the draft of the manuscript. V.L. performed the affinity purifications and protease protection assays, W.N. did the secretion analyses and J.T. performed the cloning procedures. G.W. and J.H. conceived of the study, J.H. supervised the work, and edited the manuscript. All authors read and approved the final manuscript.